Planning to go fishing on Lake Powell on Colorado river? Effective January 1, 2019, a Utah stamp will not be needed for fishing on the lake, the Arizona Game and Fish Department announced on its official portal. The lake not only spans the borders of Utah and Arizona but the “red-rock” is a favorite fishing destination for anglers. 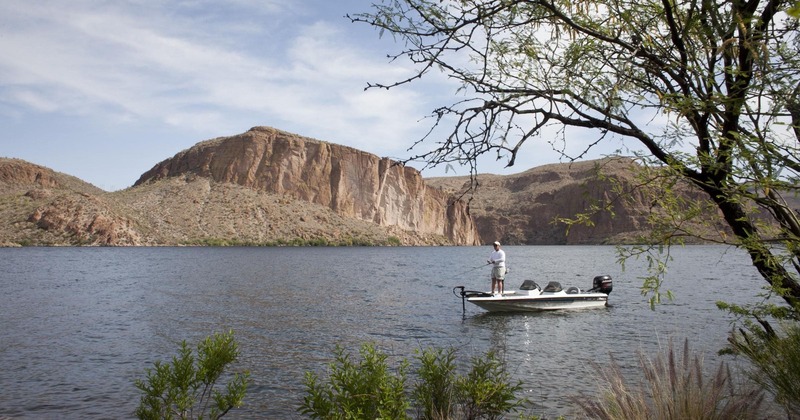 What does it mean for Arizona fishing enthusiasts? With a single resident license in hand, anglers can now legitimately fish 1,800 miles of shoreline. With this syncing of licensing rules by the Utah Division of Wildlife Resources (DWR) and the Arizona Game and Fish Department for fishing in the lake, anglers will save on the now redundant $8 Utah stamp. In a tweet, the department also thanked Utah DWR. Additionally, citizens of either states could buy a resident license from their home state. With this one license they can fish the entire 254 square mile lake. Non-residents may fish the entire lake after having purchased one of the fishing licenses either from Utah or Arizona. Moreover, the same daily and possession limits for each state will apply. It may be recalled that on January 1, 2014, AZGFD had waived the need for a $3 Lake Powell stamp. The lake is a treasure trove of a variety of sport-fish species which include striped, smallmouth and largemouth bass and walleye. Since the lake is said to be infested with invasive quagga mussels, anglers are asked to comply with respective state laws for inspection as also decontamination when they exit the lake. In another news, the AZGFD reminded its customers that beginning January 1, 2019, Arizona hunting and fishing license dealers would have the option to charge a convenience fee for the license, tag and stamp sales at their locations. Effective 1/1/19, a change in law (A.R.S. § 17-338) gives AZ hunting & fishing license dealers the option to charge a convenience fee for the license, tag & stamp sales at their locations. However, licenses, tags, and stamps bought online from AZGFD as also purchased at their offices may not need a convenience fee, the department said in an official blog post.